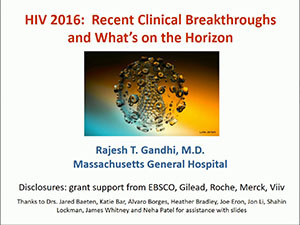 Rajesh T. Gandhi, MD, is Associate Professor of Medicine at Harvard Medical School, and the Director of HIV Clinical Services and Education at Massachusetts General Hospital (MGH). Identify recent advances in the care of HIV-infected patients. Evaluate ongoing efforts to improve future care of HIV-infected patients. Cohen MS, et al. Prevention of HIV-1 Infection with Early Antiretroviral Therapy. N Engl J Med 2011;365:493-505. Skarbinski J, et al. Human Immunodeficiency Virus Transmission at Each Step of the Care Continuum in the United States. JAMA Intern Med. 2015;175(4):588-596. The INSIGHT START Study Group. Initiation of Antiretroviral Therapy in Early Asymptomatic HIV Infection. N Engl J Med. 2015;373:795-807. Dr. Gandhi is Associate Professor of Medicine at Harvard Medical School, and the Director of HIV Clinical Services and Education at Massachusetts General Hospital (MGH). 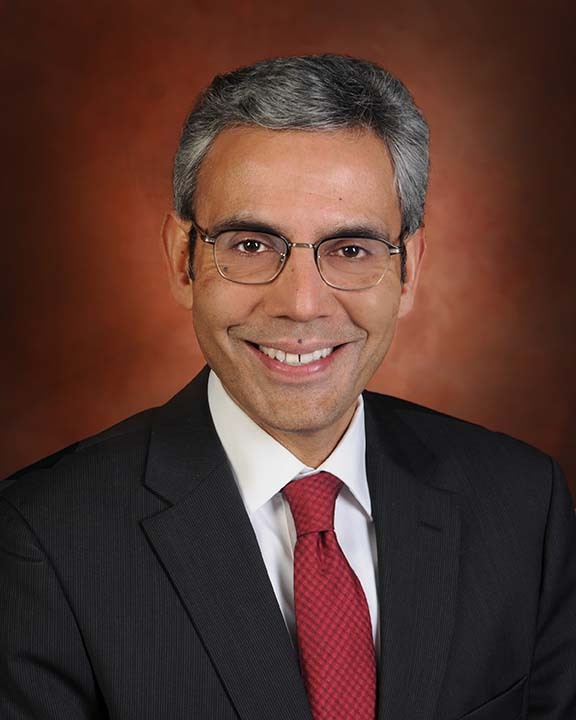 Dr. Gandhi is site leader of the MGH AIDS Clinical Research Site in the Harvard/Miriam AIDS Clinical Trials Unit (ACTU) and vice-chair of the AIDS Clinical Trials Group HIV-1 Reservoirs and Eradication Transformative Science Group. He is also the Director of the Harvard University Center for AIDS Research Clinical Core. Dr. Gandhi is the editor of Partners ID Images, an educational infectious diseases website, and organizer of the HIV Online Provider Education (HOPE) program, an internet-based educational conference series for physicians caring for HIV patients in resource-limited settings. His research interests include clinical trials of immune-based therapies for HIV, HIV reservoirs, and HIV/viral hepatitis coinfections.